PROPOSAL VOTE: It has already received 12 yes votes and will go into effect immediately. I want to welcome new managers. Dennis Dvorak took over the Jordan/Tennessee/Shenango mess rebranding them to Manhattan. Mike Morris is returning to us replacing Liverpool's Rich Magnanti. Mike might be remembered from his 2010-12 Coca-Cola Cardinals. This time around they are the Hendersonville Hornets. We also have Daniel Dumont joining us. He's replacing Chip Tantum (Syracuse) who has retired from any and all forms of APBA effective today. The Orange fade away and moved to Riverwolf. I decided that the best thing to do was combining the three teams into a dispersal draft and they would create three brand new teams. That was done on March 23-24 with Mookie Betts as the #1 pick by Manhattan. They are now fully staffed. Manhattan got it's own draft slot, Hendersonville took Liverpool slot and unfortunately Riverwolf got the Syracuse slot..... Speaking of the draft, Buffalo won the lottery and moves up to #1 from third. Great Lakes was next closest to take #2, Hendersonville grabbed #3..... Got some playoff news. Virginia took it's series with Curtis winning 3 of 4 games and heads to Syracuse for the next round..... Note on the Free Agent relievers. Saupold is grade C*r.
CARAY DIVISION: Syracuse won it's 7th pennant 11 games in front. The Orange were 15-9 in March and ended the year with a ridiculous 21 series wins at home (65w) and took 13 road series (48w). Bloomington easily grabbed 2nd place, up 18 on 3rd. The Mitts were 13-11 last month and won 18 home series (59w) but just 9 on the road (43w). In 3rd was Rochester, 29 games back of Syracuse. The Parrots were 12-12 in March and ended the year with 11 home series wins (44w) and 10 on the road (40w). Just two games back of them in 4th was Wayside. The Pioneers closed at 14-10 in March and won 11 home series (46w) but just 8 on the road (36w). Iron City took 5th place, 15 back of Wayside and 46 of Syracuse. The Houserockers were 9-15 last month, taking 7 home series during the year (33w) and also 7 on the road (34w). In the basement was Buffalo, seven back of Iron City and 53 out of first. The Blizzard were 9-15 last month collecting just 3 series wins at home (31w) but won 7 on the road (29w). HAMILTON DIVISION: Southern went 17-7 last month and grabbed it's 5th pennant, by six games. The Racers won 20 home series during the year (64w) and won 14 on the road (46w). Leland chased the Racers all year and closed it out with a 16-8 in March. The Giants had 18 series wins at home (57w) and 14 away(47w). In 3rd, nineteen back of Leland was Philadelphia. They were 13-11 last month and had 11 home series wins (46w) with 10 wins on the road (39w). In fourth was Oviedo who posted an awful 6-18 in March to finish 15 back of Philly and 40 behind Southern. The Orcas had only 7 home series wins (33w) but 8 away (37w). In 5th, only 4 back of Oviedo, was Welland who finished 12-12 last month. The Mustangs had six home series wins (34w) and eight on the road (32w). At the bottom was Reedley, six back of Welland and 50 behind the Racers. The Bridegrooms won 5 home series (33w) and four away (27w). WILDCARD: Leland's 16 win March got the Giants the top WC slot by two games over Bloomington. The Mitts 13 wins wasn't enough to hold the #4 playoff seed but it was enough to hold off Virginia. The Sox finished 5 back of the Mitts but a tidy 12 up for the #6 seed. Outside of the playoffs was Ohio & Philly who missed by 12 games and Rochester was only one game behind those two. Wayside finished up just two back of the Parrots. TEAM STATS: Curtis and Virginia, the only two teams with 1600+ hits, finished tied for the top team batting average. Technically the Engines were better by .00014 despite less hits. At the other end of that was Liverpool with a league worst 228 hitting via almost 400 less hits than the top two... Chicks dig the long ball and Rochester was the only team with over 300 "Big Al's". Southern just missed getting there. Great Lakes didn't live up to the Mashers thing and had the fewest of the four teams in the 180s... Southern was the only team with over 700 extra base hits (374/37/294). Liverpool & Welland didn't even crack 500... Virginia and Curtis were the only teams that put over 2200 runners on base. Liverpool and Buffalo had less than 1800... Great Lakes didn't hit well but they knew a ball when they saw it. They were the only team with 600 walks. Oviedo had less than 400... We had five team with over 100 steals. Manhattan topped that list edging Wayside. 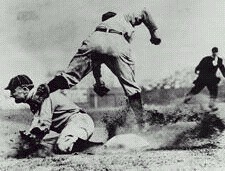 There were six players with more steals than the entire Liverpool total... Virginia killed rallies with the most GiDP's with over 150 which was almost twice as much as Wayside... Oviedo & Leland made over 100 errors while Syracuse didn't even get to 40... On the pitching side we had four teams with ERA's under four and Syracuse was best with Bloomington just a hair behind them. The Scherzer/Kluber was the major factor behind the Orange pitching stats. Great Lakes almost got into the six plus area... Bloomington had 14 shutouts while three teams only had 3... Leland and Syracuse pitchers barely gave up 200 dingers while Rochester was closing on 300... Syracuse pitchers gave out just 341 walks, Liverpool 600... Virginia and Bloomington topped 1500 k's while Great Lakes just over 1100. PLAYER HITTING STATS: MVP candidates anyone? Daniel Murphy (Ree) gave a 400 batting average a run but fell a little short at 379 to grab that title. He also topped the OBP list and OPS list and finished 2nd in slugging, 3rd in total hits. Charlie Blackmon (Cur) had the most hits 244 and was league best in triples and total bases. He was 2nd in Average (352) & OPS and 3rd in slugging. Giancarlo Stanton (Syr) pounded out 74 homers to run away with that crown. He was equally as far out front in RBI's. He also was best in Slugging (700) and extra base hits (113). We had five guys get 200 hits and Hosmer (Vir) had 222 to finish behind Blackmon. Murphy, Nolan Arenado (Lel) and Joey Votto (Cur) were the others. Jose Ramirez (Sth) had almost 70 doubles to lead that category. We had four guys get 100 extra base hits. Besides Stanton they were Arenado, Jose Ramirez and Blackmon. Dee Gordon was on top of the Stolen Base board, topping 70. Billy Hamilton (Ree) topped 60. Joey Votto (Cur) was one of two to pass 100 walks. Aaron Judge (Roc) was the other... Edwin Encarnacion (Man) was awful and is at the bottom of the qualified average list. It wasn't close either. Trevor Story (GrL) was the only batter to whiff over 200 times. Elvis Andrus (Sth) was the only player hitting into 30 doubleplays. Asdrubal Cabrera (Lel) really stunk it up with the glove and committed a horrifying 40 errors! PLAYER PITCHING STATS: Cy Young honors you ask? Max Scherzer (Syr) ran away with the ERA prize. He was almost in the 1's. Max was one of two 20 game winners and a league leading 22. His 22-3 (880) was 2nd best. His 0.76 WHIP just beat out his teammate Kluber. Corey "Klubot" Kluber (Syr) was 2nd to Max in ERA, was the only other twenty game winner (20), 3rd in WL% (20-3), 2nd in WHIP at 0.77 and his K/BB ratio was 2nd best. Those teammates combined for 42-6 WL% and 2.26ERA. Hard to beat that combo in your rotation and then you have Saves leader Craig Kimbrel (Syr) at the end. Chris Sale (Ree) won the K crown (254) and everything else related to whiffs. James Paxton (Blo) posted a league best 889 WL pct (16-2)... Nick Pivetta (GrL) gets to wear the ugly ERA crown with his 6.91 which was almost a half run worse than second worst. Think that might have caused his league leading 18 losses? He did somehow win 5. Angel Miranda (Man) was the worst in WL% (105) via a 2-17 record. Chris Archer (Ovi) gave up a whopping 49 homers. Jake Odorizzi (Wel) handed out 83 walks. AND THEN THERE'S THIS: Not much left to talk about because of all the extra stats posted on STAT page but I got a few. Roughned Odor (Ohi) was 3 for 6 on the year and that 500 average was better than anyone. Matt Davidson (Cur) was 0 for 3 but Matt Holiday (Phi) was just 17 for 121 (140)... Adam Frazier (Way) was the ping champ by never getting an extra base hit after 25 at bats... Dee Gordon (Way) may be fast but after 635 ab's he got exactly zero homers... Tommy Pham (Vir) was caught a league most 7 times in 36 steal attempts. Trea Turner (Phi) was never caught in 52 tries... Paul Goldschmidt (Iro) had 7 sac flies... Mike Zunino (Syr) never hit into a DP in 406 at bats... There were 15 position players who never played... AJ Schugel (Syr) only gave up 4 hits all year which led to never allowing a run over his 19.3 innings. At the other end of the scale, Junior Guerra (Cur) had a 12.00 ERA allowing 8 earned runs over 6.0 innings... Mike Clevinger (Lel) had a perfect 10-0 WL for 1000% in his 19 starts. Zach Eflin (GrL) was 0-8... Pat Neshek (Sth) had a 0.52 WHIP in 56 innings. Vince Velasquez (Liv) posted a 2.30 in 72+ innings... Ty Blach (GrL) made Mike Marshall proud and got in 97 games tossing 184+ innings. There were 8 pitchers who never got into a game. *** See STAT page for all of the hitting and pitching top 10s along with complete team stats.